It's a big week for stamp collecting thanks to an army of volunteers putting on the biggest postage-centric event in years. Anyone can learn the hobby enjoyed by astronauts, famous musicians, presidents and even Olympic silver medalists in tennis (my personal favorite). 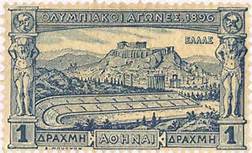 Stamp collecting is a solitary pastime. But many philatelists find a social side to the hobby by networking at local collector club events or special shows and exhibitions. Growing up in Oklahoma, this blogger attended the annual OKPEX from 1986 to 1990, exhibiting my stamps of the Olympics, U.S. presidents/monuments, Caribbean islands and the Republic of South Moluccas in youth competitions. Once settled in Atlanta years later, I made my way to a few Georgia stamp collector events almost annually since 2000. The "Olympics" of major exhibitions arrives every 10 years rather than four. And May 28 marks the opening of this decade's World Stamp Show, welcoming the public (tickets are free) at the Javits Convention Center on Manhattan's west side. The big event continues through June 4, and later this holiday weekend I'll be attending for a day while taking in a theater show near Broadway. Presentation by SPI member and two-time U.S. Olympian (1976, 1980 rowing) John Everett titled "Pulling Your Weight - A Philatelic Story of Rowing and the Olympics"
Atlanta Cultural Olympiad's president of Olymphilex 1996, Nancy Clark, presenting "Not Just Stamps - A Philatelic Story of the 1996 Atlanta Olympic Games"
Numerous Olympic stamp exhibits (some in competition) with the titles/themes "Commemorative Issue of the First Olympic Games - Athens 1896" (frames 1625-1632), "History of the Olympics Through Philately" (literature), "Olympic Games" (frames 4874-4877 from India and frames 4385-4392 from Thailand), "Poland Olympic Chronicle" (frames 4826-4828), "Olympic Games Beijing 2008" (frames 4907-4908), "The Summer Olympic Games" (frames 4406-4413) and "The 1944 Gross Born POW Olympics" (frame 2809). Last year in Atlanta, that POW Olympic display appeared in a Georgia stamp show. 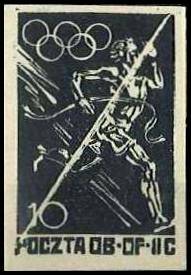 As it turns out, from July 23 to August 13, 1944, prisoners in one of the Polish Nazi concentration camps in German-occupied Poland got permission to stage an Olympic competition, including elements of a Cultural Olympiad (specifically, in-camp engraved postage stamps). I am eager to reexamine frame 2809 as my photos of the exhibition were lost with a dropped mobile phone earlier this year, and it fascinated me the Olympic spirit shined through very dark times of WWII. A black and white PDF of the exhibition is available online here. Other World Stamp Show items that enticed me to book last-minute travel include the most expensive stamp in the world -- the British Guiana One Cent Magenta of 1856 -- as well as an Inverted Jenny (as reported by The New York Times, which also wrote about the publication's short-lived mail plane and service) and other extremely rare early U.S. commemorative stamps, many of which I've only seen as photographs in books. 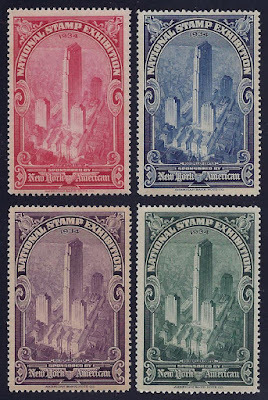 I would love to find a set of the 1934 National Stamp Exhibition cinderella stamps (image posted below) during my treasure hunt in the dealer area. 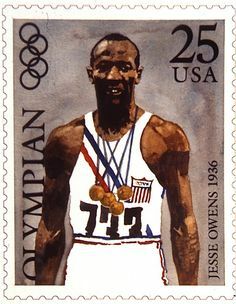 It would be fun to also stumble upon my favorite Olympic stamp designs by Robert Peak in 1984 and Bart Forbes from 1988 to 1992 (the image at right is a Forbes painting that was not selected by the USPS as they instead opted for a portrait of Jesse Owens running, also painted by Forbes). Also looking forward to learning more about SPI and International Association of Olympic Collectors (AICO) sharing booth 778, according to the show guide. Had to smile for the World Stamp Show media relations team members who landed a preview story about the event in Rolling Stone Magazine. Turns out John Lennon's stamp collection will be on view all week. 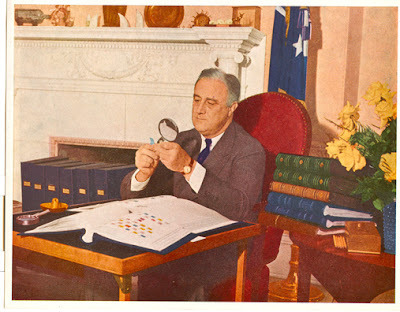 Image of FDR via Discovering Topical Stamp Collecting; World Stamp Show logo via the event home page www.NY2016.org; 1944 POW Olympic stamp image via Alphabetelately.org; Image of 1934 National Stamp Exhibition cinderella stamps via Ebay. Note: Based on reader feedback in the comments section, the paragraph concerning the Gross-Born POW Olympics was amended on June 4, 2016, to correct my erroneous description of the camp. A strikethrough indicates the error in the original post, with the words "Nazi" and "German-occupied Poland" added to correct my error. There were no POLISH CONCENTRATION CAMPS. Please correct to Nazi concentration camps in German-occupied Poland. It is important to be accurate and truthful with the history. Thank you, Krzyk, for the clarifying information. 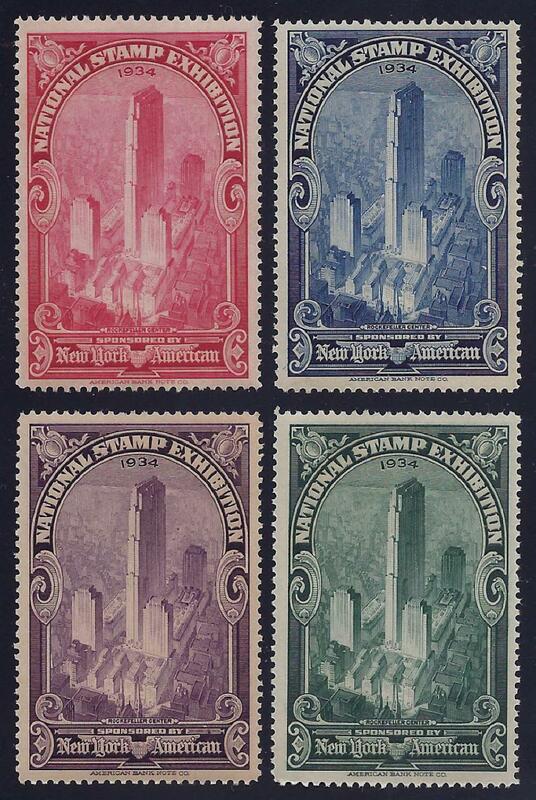 You have provided great information about Stamps and it is very important. It is quite beneficial for people to read such information.